Core 3 Surf: Enjoy a fast paced 45 minutes alternating between High Intensity Cardio and Strength work all on our surfset boards. Core 3 Barre: A total body workout on our surfset boards that uses elements and techniques of dance and Pilates to lengthen and strengthen your core. 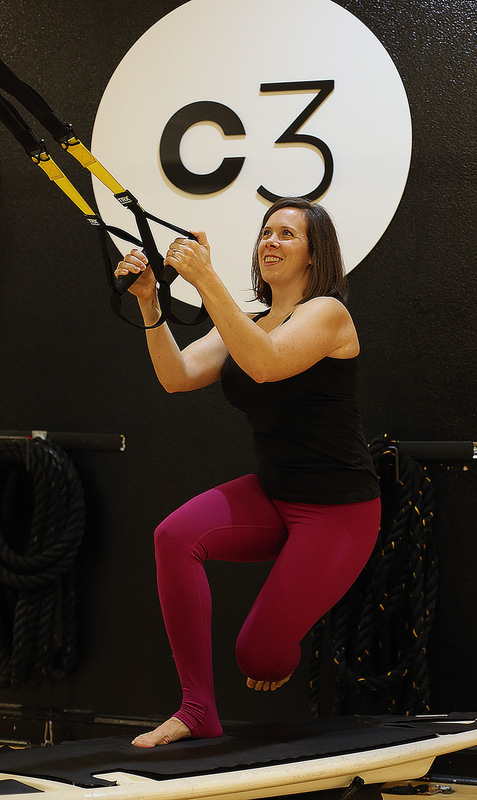 Core 3 TRX: This class uses a combo of our surfset boards along with TRX and the force of gravity to build balanced strength and rock your CORE! Core 3 Yoga: A challenging yoga class on our surfset boards. You are welcome to take the challenge or do your practice on the floor. Core 3 TRX & Ropes: A circuit style class utilizing the surfset boards, TRX and battle ropes. Pedal Fusion: see information under cycle. Pedal & TRX & Ropes: 30 minutes on our RealRyder bikes followed by 25 minutes of work with TRX & BattleRopes. CoreCycle: A cycling experience on our RealRyder bikes (30, 45 or 60 minute options). Pedal & Paddle: 30 minutes on our RealRyder bikes and then hit the boards for a 30 minute heart pounding full body workout. Pedal & TRX & Ropes: 30 minutes on our RealRyder bikes followed by 25 minutes of work with TRX & Battle Ropes. Pedal & Yoga: 30 minutes on our RealRyder bikes followed by 30 minutes of Yoga. CoreKick: A high intensity cardio kick class guaranteed to get your heart pounding and torch calories. Buti Yoga: Yoga infused with primal and tribal movements plus a maximum core workout. IronCore: This class mixes heart pounding core and cardio moves utilizing TRX, kettlebell, and RIP Trainers. Shoes Or No Shoes? We leave the decision to go with or without shoes to YOU! Going barefoot can help with balance on the boards, but some of our classes include work on the floor that may feel better with shoes. Not sure what to do? Bring clean tennis shoes and kick them off if you don't want them. If you are Cycling, you can wear regular tennis shoes or cycling shoes. We sweat and move ALOT so wear cool, comfortable clothing that allows you to stay cool and move around comfortably. Also make sure to bring a water bottle and towel.